Parking: Parking was not a problem, $10 for the day and a short walk across the street to the convention center. Even though the closest lot filled up midday there was an overflow lot just a few paces farther that didn’t fill to capacity. 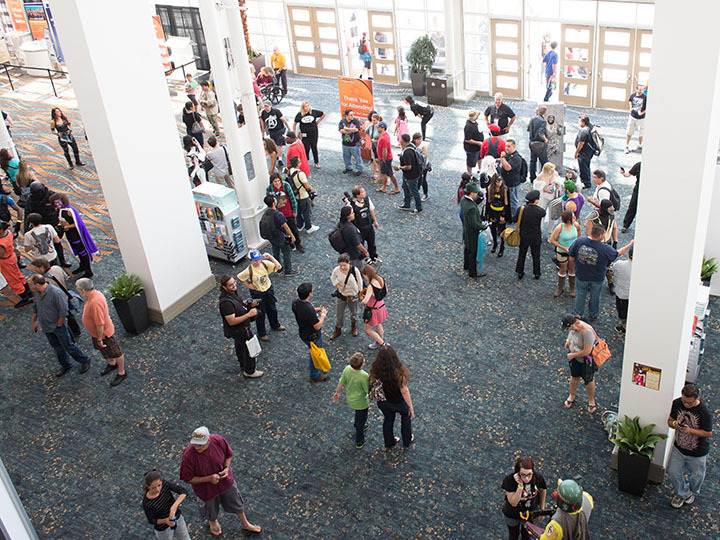 The sparsely packed lobby of LBCC remained like this most of the weekend, allowing for easy movement. Location: The Long Beach Convention Center was easily accessible by car. The con occupied the first floor lobby, and a long hallway of meeting rooms were used for panels. The second floor was closed for Comic-Con access, as another conference was taking place upstairs and they herded all the comic con attendees off the second floor, which was a shame since there were some nice shooting locations upstairs. Even though the lobby was fairly small, the space was good for the number of the attendees. It never felt crowded the way larger conventions did, and it was small enough to easily cross paths with the same people several times in the day. 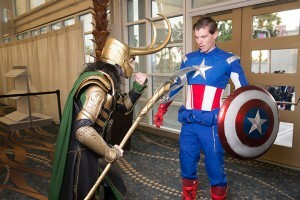 Cosplayers Loki Hates You and Humble Shield play out a meeting between Loki and Captain America. Cosplayers were given the freedom to shoot almost everywhere except upstairs, and there weren’t teams of security redirecting people around as I’ve seen happen at other cons. The off-limits areas were set at the second floor, and everything else seemed fair game. 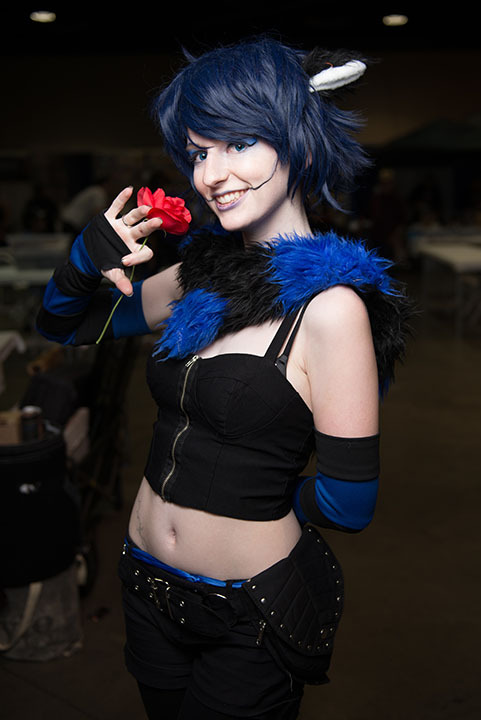 Cosplayer Meisha Mock dressed as Princess Mononoke, excitedly shows off a find at a vendor. Dealer’s Hall/Artist’s Alley: The dealer’s hall was a good size for the number of attendees. There were enough people in there to not make it feel dead, but not full of so many people that you didn’t have time to browse or chat with the vendors. Actually my favorite part of this convention was being able to take the time to talk with the vendors and artists and talk about their work without feeling pressure of holding up traffic or, as another con-goer said, “being pressed up against five other people at all times”. 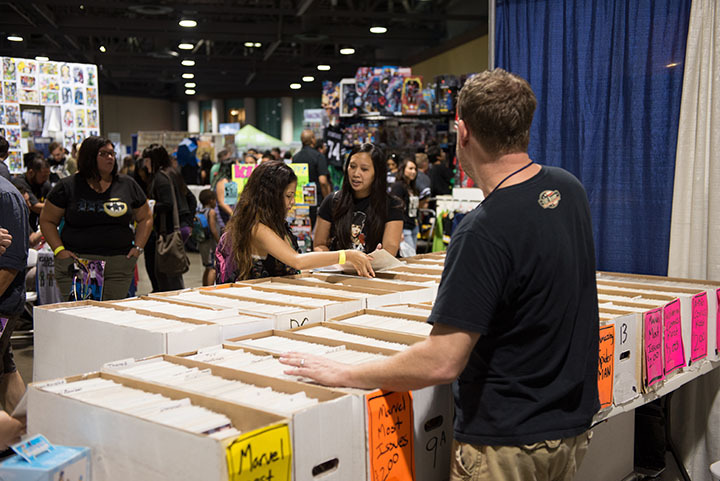 Attendees have plenty of time to browse the stacks of merchandise without being rushed. Staff: The staff were friendly and volunteers were plentiful to help direct people to where they needed to go. This event was well organized from my experience, and it was clear that this was not their first time handling an event of this type. Directions/Signage: Without the guidebook, finding out the schedule of the panels required a physical walk up and down the hallway at the poster in front of each meeting room, given the small size of the venue it wasn’t much of a problem but I did wish this information was more easily accessible from the lobby area. The most confusing part of the layout was knowing that the day-of purchases and pro/press registration was not at the front, but behind the cafe. There was also a registration booth for the other convention going on upstairs, but they were clearly labeled to be “not comic-con registration” booths. With the venue is as small as it is, it doesn’t take long to find the right place. 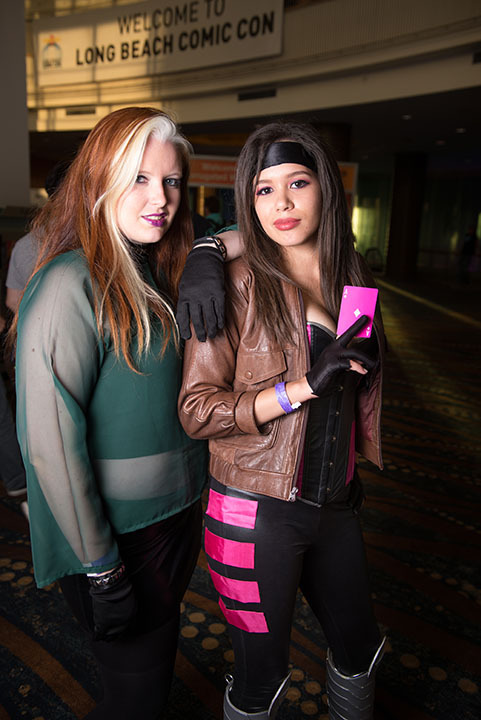 Claptrap Cosplay and Mirchan Cosplay shows off their Emma Frost and X-23 cosplays while working the OC Collector’s Corner booth in the dealer’s hall. Overall Impressions: As a smallish convention, Long Beach Comic-Con did not disappoint. I admit as a first-time goer I was a little unsure, as I had heard that one day would be plenty sufficient to enjoy everything it had to offer. Certainly you’ll finish exploring all of the dealer’s hall in a few hours. For me, the diversity of cosplayers across both days made it worthwhile. The fact that the panels are small means that you can get more interaction time with the panelists. The fact that it’s not a crowded large expansive con gives everyone a chance to take it slow, have a few meaningful conversations, and make new friends while not feeling that you have to rush to get it all done. It’s a charm of a con of this size, and not a bad thing. If you’re interested in having deeper interactions with the people behind the cosplayers, the artists, and the vendors, then the Long Beach Comic-Con might be a pleasant surprise for you, too. Sincerely Sam, a cosplayer and vendor I met in the artist’s alley, shows off her own Cheshire Cat with a smile and a flourish. 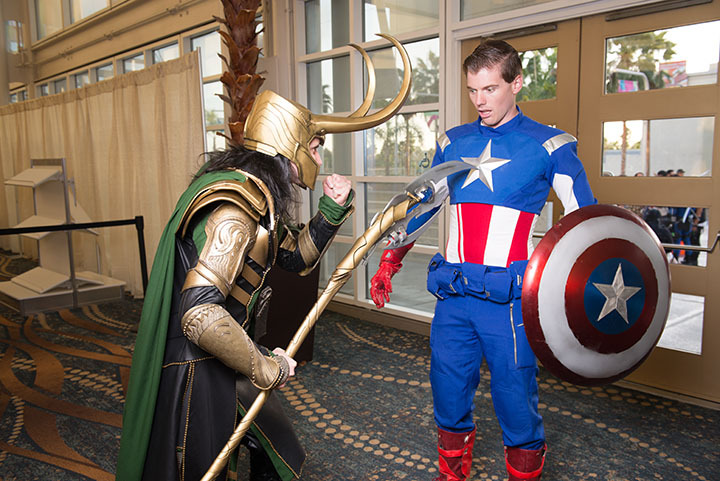 See our full cosplay coverage in the Long Beach Comic-Con 2014 gallery.